Buck Hill Falls offers an exceptional way of life. Opening its first nine holes in 1907, Buck Hill Falls established itself as the premier course in the Poconos. As golfers play through the wooded, rolling mountainside terrain, they experience the timeless design of legendary golf architects Donald Ross and Robert White. Ridgeline silhouettes, relentless undulations, and classic subtleties punctuate this 27-hole golf course. Public memberships are available; please contact the Buck Hill Falls company office for additional information. - See more at: http://www.buckhillfalls.com/Amenities/Golf. Skytop: Nestled amid the stunning backdrop of the Poconos, 18 holes of award winning, championship golf beckons. Set atop the peak of a high plateau, it is rated 4.5 stars by Golf Digest and a proud partner of Preferred Golf Club, a division of Preferred Hotels & Resorts. 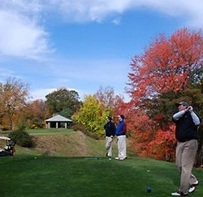 No other Poconos golfing vacations offer a mountain-style track that plays over rolling terrain and boasts wide, tree-lined fairways and small greens that challenge players of all levels. Above average in speed, this course incorporates water on two holes and plenty of strategically placed bunkers – enjoyably playable for the casual play and serious golfer alike. Book Online, call Skytop’s Pro Shop at 570-595-8910 or email golfproshop@skytop.com.